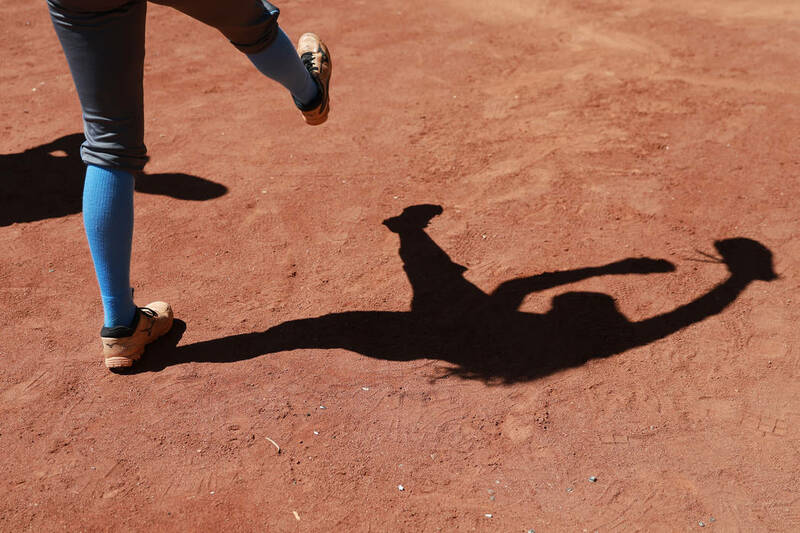 Ashlyn Wadsworth spun a two-hitter, and Pahranagat Valley capitalized on a three-base error and a passed ball in the bottom of the sixth inning to pull out a 2-1 win over Wells in the winners’ bracket final of the Class 1A state tournament at North Valleys. The Panthers (21-6) will face Wells (22-3) in the championship at 10 a.m. Saturday. Pahranagat Valley needs only one win to secure the title. Wells must win twice. Wadsworth and Wells’ Samantha Shamblin each carried a shutout into the sixth inning. Shamblin walked to lead off the top of the sixth moved to third on consecutive ground outs, and scored on a passed ball to give the Leopards a 1-0 lead. Pahranagat Valley responded in the bottom of the sixth. Morgan Harris’ one-out single to left was the Panthers’ only hit of the game, but set the stage for Karley Whipple, who bunted toward third. An error on the play allowed Harris to score and Whipple to reach third. Whipple scored on a passed ball. Wadsworth struck out six and walked five. She stranded the potential tying and go-ahead runs on base to end the game. Shamblin struck out three and walked two. Indian Springs 12, Coleville 5 — At North Valleys, Aspen Avery tossed a five-hitter with 10 strikeouts and went 3-for-4 with two runs scored to help the Thunderbirds eliminate the Wolves. Hailey Linfoot was 2-for-4 with two doubles and two RBIs for Indian Springs, which used a four-run third inning to build an early 5-0 lead and a six-run sixth to put the game away. Gabi Vega was 2-for-3 with a home run and two RBIs for the Wolves (17-7). Wells 11, Indian Springs 1 — At North Valleys, Shamblin stymied the Thunderbirds, allowing just two hits as the Leopards rolled to a six-inning win in the losers’ bracket final. Shamblin struck out seven and walked two. Wells led 5-0 after two innings, scored three times in the fourth and three more times in the sixth, ending the game on the mercy rule. Shamblin was 3-for-4 with a double and an RBI, and Keegan Laughlin went 1-for-3 with a home run and two RBIs for the Leopards. Avery was 2-for-2 with a double for Indian Springs (16-9). Sydney Connors and her Lowry teammates ended Boulder City’s dream of winning its first softball state title since 2010. Connors belted a fifth-inning grand slam and helped the Buckaroos to a 13-2 win over the Eagles in the losers’ bracket final of the Class 3A state tournament at Reno High. Connors’ grand slam gave Lowry a 6-0 lead, and the Buckaroos added four runs in the top of the sixth and three more in the seventh to pull away. Lowry (26-9) will meet Churchill County (26-9) for the title at 10 a.m. Saturday. Connors was 3-for-4 with a double and scored three times, and Alyssa Kuskie went 3-for-5 with two runs for Lowry. Kylie Sappington also homered for the Buckaroos. Bailey Bennett-Jordan was 2-for-3 for Boulder City (25-11). Churchill County 2, Boulder City 0 — At Reno High, Bennett-Jordan spun a three-hitter, but the Greenwave scored two unearned runs in the top of the fourth inning and downed the Eagles in the winners’ bracket final. Bennett-Jordan struck six and didn’t allow a walk. Churchill County scored twice in the fourth when Stacy Kalt reached on an error and came around to score on Jordan Beyer’s two-out double. Aspen Mori followed with an RBI single to plate Beyer. The Greenwave’s Faith Cornmesser also tossed a three-hitter. She struck out 10 and walked four. Lowry 8, Pahrump Valley 0 — At Reno High, Skyler Lauver went 3-for-3 with two doubles, but the rest of the Trojans’ offense couldn’t get untracked as the Buckaroos eliminated Pahrump. Sylvie Prokasky spun a five-hitter for Lowry, which scored single runs in the fourth and fifth innings before exploding for six runs in the sixth. Sierra Mastrejuan was 3-for-4 with two doubles and two RBIs, and Prokasky went 2-for-3 with three RBIs for Lowry. Needles kept its tournament hopes alive into extra innings Friday, but fell victim to Pershing County, 3-2 in nine innings in the losers’ bracket final of the Class 2A state tournament at Reed High in Sparks. Pershing County (28-5) will meet White Pine (26-11-1) for the state title at 10 a.m. Saturday. White Pine needs only one win to claim the crown. Pershing County must win twice. Needles concluded its season 21-9. Needles 14, Laughlin 4 — At Reed, winning pitcher Jaycee Fragoso homered to lead the Mustangs by the Cougars in an elimination game. Paige Murch added a triple and a double for Needles. Laughlin completed its season 14-11-1.